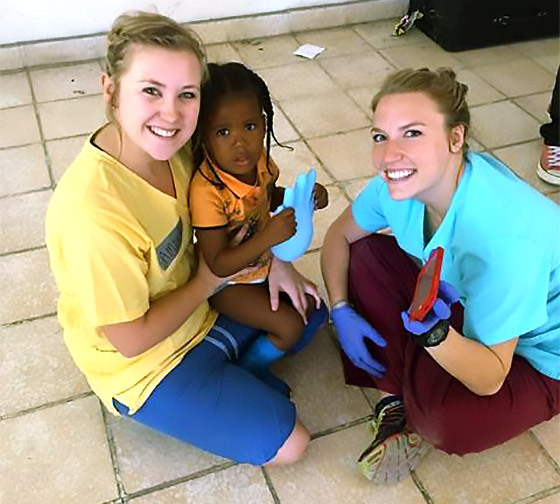 Students and faculty from the Physician Assistant (PA) and Physical Therapy (PT) departments at Wichita State traveled to Haiti last November to provide much needed medical services to Haitian residents. PA Director of Didactic Education Emily Mirakian, PA students Courtney Snyder and Michelle Kaufman, and PT students Brooke Hansen and Amber Buckles, donated their time and talents to the Dr. Victor Brinkley Hospital in the city of Pierre Payen. They traveled in collaboration with the humanitarian organizations Grace 4 Haiti and Project HELP. The group was accompanied by Wichita-area practitioners Dr. Naomi Shields, orthopedic surgeon at Advanced Orthopaedic Associates; Dr. Richard Steinberger, urologist at the Wichita Urology Group; and Max Jolly, third-year medical resident at the University of Kansas School of Medicine. Other practitioners and students throughout Kansas were on the trip, as well.